By one of the foremost historians and translators in the field of Classics, Peter Green—an authoritative, modern translation of a long-neglected historian whose work covers the most vital century in ancient Greek history. Only one surviving source provides a continuous narrative of Greek history from Xerxes' invasion to the Wars of the Successors following the death of Alexander the Great—the Bibliotheke , or "Library," produced by Sicilian historian Diodorus Siculus (ca. 90–30 BCE). Yet generations of scholars have disdained Diodorus as a spectacularly unintelligent copyist who only reproduced, and often mangled, the works of earlier historians. Arguing for a thorough critical reappraisal of Diodorus as a minor but far from idiotic historian himself, Peter Green published Diodorus Siculus, Books 11-12.37.1 , a fresh translation, with extensive commentary, of the portion of Diodorus's history dealing with the period 480–431 BCE, the so-called "Golden Age" of Athens. This is the only recent modern English translation of the Bibliotheke in existence. In the present volume—the first of two covering Diodorus's text up to the death of Alexander—Green expands his translation of Diodorus up to Athens' defeat after the Peloponnesian War. In contrast to the full scholarly apparatus in his earlier volume (the translation of which is incorporated) the present volume's purpose is to give students, teachers, and general readers an accessible version of Diodorus's history. Its introduction and notes are especially designed for this audience and provide an up-to-date overview of fifth-century Greece during the years that saw the unparalleled flowering of drama, architecture, philosophy, historiography, and the visual arts for which Greece still remains famous. Peter Green is James R. Dougherty, Jr., Centennial Professor of Classics Emeritus at the University of Texas at Austin. Currently he serves as Adjunct Professor of Classics at the University of Iowa. He has authored, edited, and translated over thirty books, including Diodorus Siculus, Books 11–12.37.1: Greek History, 480–431 BC—the Alternative Version ; From Ikaria to the Stars: Classical Mythification, Ancient and Modern ; Alexander to Actium: The Historical Evolution of the Hellenistic Age ; The Greco-Persian Wars ; and Apollonios Rhodios: The Argonautika . In a recent review (BMCR 2007.02.48) of a volume of Italian articles devoted to Diodorus Siculus, Catherine Rubincam—a scholar who has done as much as anyone to upgrade Diodorus' abysmal reputation—described him, crisply, as "the historian whose work every modern historian of ancient Greece must use, while fervently wishing this could be avoided." Use him they certainly must. His is the only connected ancient narrative of the period from the Persian Wars to the early conflicts of Alexander's successors. Without what survives of his work, we should know virtually nothing—to take two obvious examples—about the history of ancient Sicily or the reign of Philip II of Macedon. His chronological markers, book after book, despite their incidental errors, underlie much of our modern dating of ancient events; did they not exist, our knowledge of the Athenian archon list (to look no further) would be in tatters. It might be thought that modern scholarship would take all that this late, plodding, scissors-and-paste historian could give them and be thankful. Instead, a tradition developed in the nineteenth century of treating him as a mental defective: when he said what critics wanted to hear, that was due to his mindlessly copying a good source; when he did not, that was the result of his own stupidity. There have been several unfortunate results of this general reaction. Large numbers of serious historical difficulties that Diodorus' text raised were shelved or ignored on the grounds that this historian could not be taken seriously. Until recently the text of the Bibliotheke was studied only for what it might be able to tell us about its supposed sources. Lastly, no one in England or America has chosen to translate it in the last half-century, presumably out of fear of being associated with the mindlessness of its author. It is really astonishing, considering the crucial periods covered by the surviving books, that in fact the only English-language version available is that provided by the Loeb Classical Library. Thus, what I have primarily set out to do is to fill a serious gap. The aim of the present work (which will be followed by a companion volume taking the narrative as far as the death of Alexander, which closes Book 17) is to provide a new translation that treats Diodorus as a minor, but perfectly sane, universal historian; is cognizant of recent scholarship; and handles his text with an eye not only on the manuscript tradition but also always on the many historical problems that are to be found in his pages. Further, while Diodorus' style is unremarkable, it is not—as might be assumed on occasion from the Loeb versions—leaden, and I have done my best to replicate his always clear, and often brisk, narrative prose. In certain cases I have retained Greek terms when no sufficiently precise English equivalent exists or when the common translation carries misleading overtones. These are as follows: (i) barbaros, pl. barbaroi. Commonly rendered as "barbarians," which carries over-pejorative implications. From Herodotus onward, the term covered those, mainly Thracians or Asiatics, whose speech was unintelligible. The recent habit of translating barbaroi as "foreigners" ignores the fact that Greek has a perfectly good term for foreigners, that is, xenoi: there is a distinction between the two. (ii) demos, the voting members of a democratic or populist community, acting in assembly. (iii) proxenos, the representative of one city or state in another. Often translated by "consul," but this is wrong: a proxenos was a citizen, and resident, of the host community rather than of the community he represented. (iv) stadion, pl. stadioi, the distance (roughly 200 yards) and name of the main Olympic footrace. (v) tyrannos: this term causes endless trouble. Essentially it defines any ruler who obtains power otherwise than through succession or election; it does not per se imply despotism or moral condemnation, though latterly (for the most part due to the strictures of Hellenistic philosophers) it came to have much the same implications that "tyranny" does to the modern reader. Tyrannis is the abstract term for the rule of a tyrannos. (vi) stasis, civic conflict, ranging from factional rivalry to outright civil war. Green (2006) covers the period to the outbreak of the Peloponnesian War in much greater detail and depth, with full documentation and commentary. The translation of Diodorus in that volume has occasionally been improved or corrected, while the spelling of proper names has—much against my natural inclination—been Latinized for easier general access through linkage to other works; but otherwise the present volume, which covers 480 to 401, offers radically reduced notes, a virtually identical text, and an introduction that distils the essence of my earlier, more technical presentation, that was aimed, in the first instance, at fellow-professionals. Thus, unlike my earlier study, this version does not pretend to offer a commentary in depth (I have not, for example, seriously explored the Bibliotheke 's chronographical difficulties but have merely noted their impact as they occur). My model has been, from the start, the excellent translation of Justin by Yardley and Develin: a short, general introduction and a translation accompanied by minimal running notes designed to clarify the text and historical background, for an audience of students, teachers, and some general readers who may enjoy the Bibliotheke , for a change, as it is seldom read (most scholars merely consult isolated passages): an unbroken narrative covering the most momentous century of Hellenic history, in the Italo-Sicilian West as well as on the Greek mainland and in Asia Minor. My bibliography is mostly a guide to further reading in English-language sources, except for those works of foreign scholarship that I have used to clarify various issues and cite for the benefit of fellow-academics. For the benefit of general readers who may not be acquainted with the history of the period, I give here a brief guide to reading the present volume. For the Persian Wars, it pays to have Herodotus at hand: the most useful translation currently available is Marincola 2003. For background, use Green 1996, Lazenby 1993 (which contradict each other throughout), and Cartledge 2006. 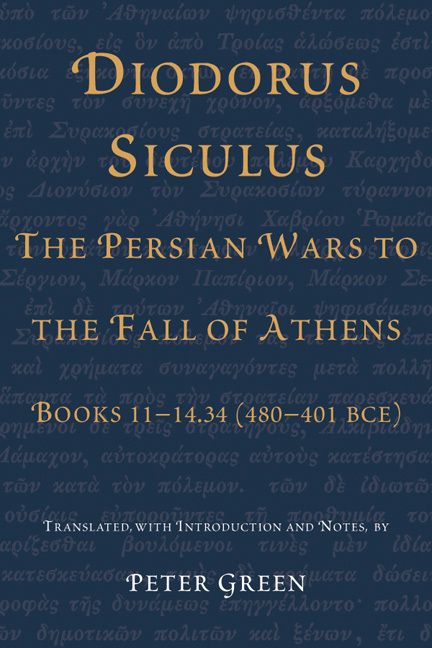 The period between the Persian and the Peloponnesian wars is briefly covered by Thucydides (best translation, Lattimore 1998): back up with French 1971, Kagan 1969, Meiggs 1972, Badian 1993, and Green 2006. The Peloponnesian War itself: Thucydides throughout (Lattimore 1998), with Kagan 1974, 1981, and 1987 as backup. The Thirty: Xenophon's Hellenica (Cawkwell 1978), with Krentz 1982 and Strauss 1987 for background. For Sicily and Italy during the period covered by this volume (except for the Athenian invasion of 415-413), Diodorus is virtually the sole ancient text. Back-up is from Finley 1968, Freeman 1891-1894 (if you can find a copy), Caven 1990, Green 2006. My use of available Greek texts has been eclectic. Where possible, I have relied primarily on the new—and newly edited—French Budé series: Haillet for Book 11, Casevitz 1972 (with reservations) for Book 12, Bonnet and Bennett for Book 14. For Book 13 I went back to Vogel's now elderly (1893) Teubner and Oldfather's 1950 Loeb, the latter being (with one or two interesting deviations) virtually a reprint of Vogel. At the same time there are quite a few places in Books 11, 12, and 14 where I prefer Vogel's or Oldfather's earlier readings to those of the Budé editors. Luckily, there are comparatively few textual cruxes (the main problem is lacunas), and where they exist, I have added a brief explanatory note. Only in such notes, where exact readings are crucial, have I sometimes printed the original Greek, and these words have always been transliterated as well as translated. As before, I must acknowledge the enormous help I have had from my predecessors in the business of reestablishing Diodorus as a source to be studied in his own right and not sidelined as a mere brainless copyist: above all, John Marincola, Catherine Rubincam, and Kenneth Sacks, whose work continues to inspire me, not least in those dark moments when Diodorus seems to have taken me over forever, and I remember that originally I began investigating him only as a preliminary to working on my commentary to Herodotus, now for too long on that traditional back burner. It is some compensation that my ideas on the Greco-Persian wars, the Pentecontaetia, and the Peloponnesian war have been sharpened as a result of my pursuit of Diodorus, though any real insights I have gained have been largely due to what I have learned as I went from friends and colleagues such as Ernst Badian, John Buckler, Paul Cartledge, and Simon Hornblower. The anonymous readers for UT Press pointed out numerous anomalies: I am grateful to them both for their lynx-eyed ability to spot faults and also for their (mostly) acceptable solutions. My wife, as always, has been professionally tolerant of my odd obsession with this minor historian, to the point of encouraging me to see him through (as a necessary precondition, I suspect, for returning full time to Herodotus). As usual, the Interlibrary Loan team of the University of Iowa filled my requests with exemplary speed and efficiency: behind my necessarily brief notes much research, inevitably, lies concealed. Finally, a confession. In the course of translating so much of Diodorus, I have, I must admit, become rather fond of him. I know his faults as well as anyone—not least the stereotyped phrases he trots out, time and again, to describe a battle or the moral values he attaches to his major characters, both pro and con. But his personality is companionable, and in serving him as best I can I feel I am at least making some amends for the mean and contemptuous aspersions on his intellect, judgment, and historical vision that scholars have so freely expressed over the last century and a half. Armchair scissors-and-paste historian he may be, but (not least in return for much precious information that only he provides) at least he deserves better treatment than that. Few people apart from professional ancient historians know anything about Diodorus Siculus, and even ancient historians for the most part consult his text rather than read it. Those who have heard of him probably repeat the one cliché he invariably elicits, carefully fostered by generations of academics: that he is an unimaginative copyist only as good as his current source. Yet Diodorus provides us with our only connected narrative of the period from the Persian Wars to the internecine conflicts between Alexander's immediate successors; without him we would know virtually nothing of the early history of Sicily and South Italy and much less about Athens in the mid 5th century or the career of Philip of Macedon. For these reasons alone—not to mention his contribution to the chronography of the ancient world—he would be worth our careful attention. When we seek details about the man himself, we are, as so often with ancient authors, almost entirely dependent on incidental information furnished by his own work. There are only two external references, both placing him firmly in the last years of the Roman Republic. St Jerome, in his version of Eusebius' Chronicle , identifies 49 BCE as the year in which Diodorus acquired public fame. An entry in that late Byzantine lexicon the Suda informs us that he "lived in the time of Augustus Caesar and earlier." In fact, as we shall see, he probably died before, or very soon after, Octavian's victory at Actium in 31/0 BCE. Diodorus Siculus was born about 90 BCE in Agyrium (modern Agíra), a small town in northeast Sicily ("Siculus" in his title means "the Sicilian"). He was proud of his birthplace and refers to it frequently. The earliest date he provides relating to his own activities is the 180th Olympiad (60/59-57/6 BCE), during which, he tells us (1.44.1), he began his period of residence in Egypt. Can we place his arrival date more precisely? He witnessed (1.83.8-9) the lynching of one member of a Roman mission who accidentally killed a cat; this incident took place, he tells us, before the recognition of Ptolemy XII Auletes as a "friend" of Rome. We know that this recognition, achieved through massive bribery, was negotiated by Caesar and Pompey in 59 (Suet. Div. Iul. 54.3). It thus seems clear that Diodorus' arrival in Alexandria is to be dated in 60 or early 59, while the purpose of his residence was almost certainly research in preparation for the composition of his Bibliotheke , in particular the opening books with their emphasis on early myth. He was still there in 55—at 1.44.4 he remarks that the Ptolemaic dynasty had, at the time of writing, lasted 276 years—but at some point prior to 452 he began a prolonged period of residence (1.4.2-3) in Rome. How long this lasted is uncertain: it is possible that late in life he retired to Agyrium and died there. One of the few inscriptions from his birthplace (IG xiv 588) is the gravestone of "Diodorus son of Apollonius." The name is common, but the coincidence remains striking. When did Diodorus die? The latest historical event he mentions is Octavian's expropriation of the Greek inhabitants of Tauromenium (modern Taormina) in 36 BCE (App. BC 5.109-111). Since he refers to the Ptolemies as the latest rulers of Egypt, and makes no allusion to Octavian's takeover of Egypt after Actium, it is evident that he was not editing his work for publication later than 31/0 BCE, and it is unlikely that he lived much longer. What else can we deduce about his personality or his career? All the evidence suggests that his entire adult life was occupied in researching and writing the Bibliotheke : he himself claims (1.4.1-2) to have devoted thirty years to the task, including a period of travel for purposes of autopsy. Since no patron receives the customary encomium in his surviving text, it is a fair assumption that Diodorus was a gentleman of private means. If this means that he was a Sicilian landowner, the civil wars of the late Roman republic did not treat him kindly. He was a young man during Verres' notorious administration of Sicily (73-71 BCE), when Agyrium suffered from extortion as well as overtaxation. Many property owners sought redress in Rome for ruined estates and illegal expropriations (Cic. ii Verr. 2.91-100, etc.). After a brief (and much debated) period of entitlement to some form of citizenship (Green 2006, 6), in 36 Sicily was taken over by Octavian, who subjected the island to worse indignities than even Verres had inflicted, including not only a 1,600-talent indemnity but also mass confiscations of property and relocation of the inhabitants. Agyrium lay at the center of the area that had supported Sextus Pompeius and was thus the target of Octavian's especial animus. Many lost their property, and not a few their lives, to new Roman colonists, especially Octavian's veterans. Was Diodorus one of these? His repeated advocacy of humanity and moderation in the treatment of victims by the powerful is suggestive; and as we shall see, it is extremely likely that he died before his revision of the Bibliotheke 's text was half complete. Details he lets fall about his character and outlook hint at a rather solitary personality. Like many historians in antiquity, he presents himself as conventionally religious (while at the same time obsessed with Tyche: Fortune, fate), and he repeatedly asserts that the prime purpose of history is as an instrument for moral improvement. He relishes occasions on which he can plausibly point to divine vengeance overtaking the impious. He also, however, has an antiquarian's taste for the oddities of myth, and raps other historians for not paying sufficient attention to this area. Ostensibly, the reason for this, he claims, is the variety of good moral lessons myths inculcate. In fact, he obviously enjoys them for their own sake. Like Herodotus, he has a passion for marvels (thaumata) and a weakness for fascinating digressions, while simultaneously taking Herodotus himself to task for inaccuracies and overcredulity. Unlike Herodotus, he gives the impression of disliking and mistrusting women. All in all, he does not reveal overmuch about himself. The Bibliotheke , or "Library" (sometimes referred to by later writers as the "Historical Library"), is oddly titled; modern scholars often refer to it, without ancient justification, as Diodorus' Universal History . The latter is a fair description but not what the ancient world knew it as. Did Diodorus so call it, modestly, from the numerous works on which he drew to complete his narrative? Did he perhaps also have in mind the great Alexandrian Library (where he surely worked) and its tradition of the catalogue raisonné and description (pinax) of books on a specific topic? Impossible to tell. Self-deprecating though the author may have been about his originality, he nevertheless planned on a vast scale. Six books (1-6, probably in his original plan the first of seven hexads: see below) dealt with mythical matters prior to the Trojan War: these books, exceptionally, are not subsumed to a chronographical pattern, since, he explains (1.5.1), for this early period no reliable chronological data existed. (He obviously, and rightly, distrusted the kind of witness provided by the Marmor Parium of 264 BCE, which confidently provided the firm date of 1531/0 for the quarrel between Ares and Poseidon over the Areopagus.3) For him as for many, the Trojan War formed a kind of stepping-stone between the mythic past and increasingly documentable history: on the near side of it, chronographical criteria apply. We possess, regrettably, only fragments, for the most part anecdotal, of Books 6-10. But with Book 11 (the first in this volume), covering Xerxes' invasion in 480 BCE, we are introduced to the three-strand chronographical system Diodorus employs for the rest of the Bibliotheke . Every year he correlates his narrative with (i) the Athenian eponymous archon; (ii) the quadrennial Olympic athletic contests (together with the victor in the stadion); (iii) the consular Fasti at Rome. Our own BCE/CE chronographical axis is so taken for granted that we "forget just how much synchronistic work our predecessors going back to the Renaissance had to do in order for us to be able to say something like 'Xerxes invaded Greece in 480 BCE'" (Feeney, 12). So, in what we take for granted as 480, Diodorus pinpoints the year as that in which Calliades was archon, when the consuls were Spurius Cassius and Proculus Verginius Tricostus, and the 75th Olympiad took place. Diodorus did not create this system from scratch, though he made it more thoroughly universal than most. He used the Chronicle composed in verse (to aid memorization) by Apollonius of Athens (c. 180-110 BCE). He borrowed the use of Olympiads and Athenian archons from the Sicilian historian Timaeus of Tauromenium (c. 350-260 BCE), and the deliberate "interweaving" (symplokê) of synchronicities from Polybius (c. 200-c. 118 BCE). The latter, in particular the use of the Roman Fasti, led him into frequent error, most often through ignorance of nonconsular interregna when working out consular years: for example, in Books 11-12 we find consuls misdated by six or seven years (those cited for 480 actually belong in 486). He also tends (Green 2006, 12) "to blur midsummer distinctions between archon-years [which ran from July to June] when narrating events through a campaigning season, and to write achronic introductions, or postscripts, covering an extended period, under the rubric of one specific year." The Bibliotheke was originally planned in forty-two books, comprising seven hexads, and terminating in 46/5 BCE with Caesar's quadruple triumph and appointment as Dictator.4 (Fifteen of these books [1-5, 11-20] survive intact; for the rest, we have extracts and fragments only.) But at some point Diodorus changed his mind, breaking the narrative off in 60/59, at the beginning of the Gallic Wars. As we have seen, he had little reason to love Octavian; but he must have seen, in the years immediately before Actium, that it would be more prudent, whichever way the conflict went, to cut his Caesarian narrative short, even if that meant spoiling his hexadic structure by losing two final books. In any event, he did not eliminate all traces of his original schema: his total count of 1,138 years from the Trojan War to (allegedly) the outbreak of the Gallic Wars (a date he gets right) takes us not to 60/59 but to 46/5 (1.4.7). In all probability, he died before he had time to revise this and other details: there are passages in Books 11-17 (commented on ad loc.) that read like rough first drafts, sometimes even like alternative notes jotted down from different sources. As Diodorus knew, the idea of writing "universal history," encouraged by the steadily widening horizons of the Mediterranean world, had been around for a long time. As he also knew (and pointed out, 1.3.2-3) earlier attempts had not, for a variety of reasons (mostly omissions: the mythic past, the affairs of barbaroi) been successful. No one had come close to the scale of world events he proposed to encompass. Herodotus' survey of the provinces of the Achaemenid empire had pointed the way. Isocrates' notion of Panhellenism as a cooperative Greek venture against the barbaroi had built on this earlier work. Ephorus of Cyme (c. 405-330 BCE), one of Diodorus' main sources, covered a wide sweep (he began with the Dorian invasion and had got as far as Philip II's siege of Perinthos when he died), divided his work into books with prefaces, stressed moral improvement as a major reason for writing history, and seems (perhaps on this account) to have sought out ad hominem scandals when in search of political motivation. This grubbing after what a later critic nicely described as "all the secrets of seeming virtue and unrecognized vice" was brought to a fine art by Theopompus of Chios (? 378/7-c. 320 BCE) in his Philippic History , which excoriated the Macedonian court with invective that owed not a little to the Cynic diatribe. We have already noticed the work of Timaeus of Tauromenium, both his chronographical innovations and his massive Sicilian History : both utilized by Diodorus, who also rook over with some enthusiasm his moral trope of divine intervention overtaking evildoers. Some of Timaeus' faults, categorized with venom by Polybius (12.3-4, 25E-G, 27-28), recur as regular charges against universal historians, Diodorus included: uncertain autopsy, lack of military experience, ignorance of geography, overdependence on earlier written sources, fictional reported speeches, local patriotic allegiances. In Diodorus' case, such accusations (true in certain cases) have been consistently and systematically overdone. The two major factors that really opened up the whole concept of universal history, however, were Alexander's eastern conquests (which disrupted old accepted notions by totally changing the face of the inhabited world, the oikouménê) and the meteoric rise of Rome, in half a century, to the status first of a world power and second, by Diodorus' day, to that of the only Mediterranean power that counted. Roman imperium, in fact, became the central unifying element, both geographically and chronologically, of the entire universalist methodology: we can watch all the strands being interwoven (symplokê again) in Polybius' narrative (which Diodorus clearly knew and used), along with the notorious fallback of Tyche (Fate, Fortune, the random factor) to account for the embarrassing ease with which Rome had risen to dominance over the Hellenic world. Diodorus also borrows from Polybius (38.6.1-7), who perhaps was inspired by Herodotus, the device of using regular digressions to ease the reader's intellectual concentration. All these traits are consummated in the work of Posidonius of Apamea (c. 135-c. 51 BCE), the great Stoic polymath, who began his History in 146, the year in which both Corinth and Carthage fell, as a direct sequel to Polybius. In Posidonius we see the emergence of that seamless cosmic sympatheia between microcosm and macrocosm, with Tyche governing all human actions—all that happens is fated to happen—where Roman imperium and the cosmic order become virtually indistinguishable, paving the way for a succession of emperors to be assimilated without trouble to the divine pantheon. As early as Ovid's day the worldview thus delineated had become a commonplace: Romanae spatium est Urbis et orbis idem ("The city of Rome's dimensions are the same as the world's"; Fasti 2.683). It is thus not surprising that Posidonius' entire approach is that of a moral philosopher or that Diodorus could envision universal history as a succession of object lessons in virtue and vice. The Bibliotheke indeed reveals Diodorus as in every respect a typical product, intellectually and historiographically, of the late Hellenistic age, distinguished only by the scope of his universalist ambitions. Herodotus, Ephorus, Timaeus, Polybius, and Posidonius—together, in all likelihood, with others whose work has failed to survive—all, as we have seen, left their mark on him. He also refers, in the course of his surviving text, to Thucydides, Xenophon, Theopompus, Philistus, and Hieronymus of Cardia. The long popular theory that he knew few, if any, of these at first hand (e.g., that his acquaintance with Herodotus was limited to references in Ephorus) is, at best, a gross exaggeration. The texts of the great classics were easily available; it would be extraordinary had he not read them as part of his basic education. Diodorus also gives evidence of understanding many of the key principles of historiography that had been evolved by his day (Green 2006, 25). He emphasizes the need, where possible, for autopsy (3.11.3) and for a proper consideration of antecedent causes, topography, and social background as a basis for narrative exposition (18.5.1). Selectivity (4.5.2), proper proportion (4.5.4), careful examination of detail (4.46.5), and the need to compare and evaluate variant sources (2.32.1) are all stressed. Though he is not above inserting lengthy speeches himself (see, e.g., 13.20.1-32.6), in what may be a swipe at Thucydides he objects to them being made a substitute for analysis (20.1-2.2). He is aware of the distortions produced by ethnic prejudice (3.34.6). His rationalization of myth (3.52.1-3) is in an intellectual tradition that goes back to the best thinkers of the 5th century. Unimaginative he may be, but a mindless idiot he most certainly is not.